As banks roll out teller image capture to their bank branches, a hidden cost awaits many of them as they begin to see higher volumes of non-conforming images (NCIs) and MICR issues show up in their image processing departments. The cost of researching and repairing a check that is returned by the Fed can range from $9-$27 per item, while the cost of items on which the MICR can’t be read is estimated at $0.25 per item and misreads cost between $0.05-$0.10 per item. These are costs that are not often factored in when calculating ROI for a teller image project. The additional costs are between $5,000 to $25,000 for just the MICR issues for every 1 million checks processed. Add to that the cost of NCIs that need to be researched and repaired and a bank can find that ROI numbers are upside down very quickly. The cost of teller image capture is not just in the cost of software and hardware. Digital Check has developed technology within our API to help minimize the number of MICR misreads and can’t-reads, as well as the number of NCIs returned from the Fed. Image and MICR quality will have the most noticeable impact on the ROI of a teller front counter project. Distributed check capture on desktop check scanners has been in use since the passage of the Check Clearing for the 21st Century Act (Check21) in 2004. Now, most check clearing is occurring via remote deposit capture as businesses capture and submit their own deposits to their bank. In most cases, banks allow their customers to fill in or correct missing or misread data in the MICR field, as well as the amount of the check, reducing the workload on the bank. With the advent of teller check capture, bank personnel are also now responsible for filling in missing or incorrect MICR information and the amount fields that weren’t read by the CAR/LAR (courtesy amount/legal amount recognition) application, a process that can impact teller transaction time. In addition, check images that do not clear the Fed are returned to the bank’s image processing (IP) department as non-conforming images (NCI), requiring the IP department to key in information and, at times, to have to research the original document. All of this leads to increased cost and time to the project, often cost and time that wasn’t accounted for in the planning phase. Digital Check has helped banks to both lower the number of NCIs and increase the MICR read rates by implementing our Best Read technology. Best Read technology accurately captures more of those difficult documents and reduces the need for teller intervention to key in MICR amount field information. Here’s how it works. Digital Check’s Best Read Image utilizes adaptive thresholding, a special algorithm that applies three different thresholding settings to each document, intelligently “voting” on the cleanest image to pass along to the application. Along with adaptive thresholding, Digital Check also incorporates our Special Document Handling (SDH) feature. SDH was created for those difficult to read documents such as money orders, checks with heavy backgrounds, checks with security pantographs, or checks written with gel pens. SDH allows us to set unique thresholding settings that are specially adapted to that particular type of document. 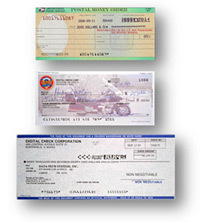 In the case of documents with varied printing, for example, money orders that have heavy and dark printing on one side and light or white printing on the other, Digital Check can read these documents with “zoning” in which we have different thresholding settings based upon the zone of the document we are reading. This is a unique feature to Digital Check’s API. The other challenge for teller capture is MICR read quality and rates. Here, Digital Check excels again with our Best Read MICR feature. Best Read MICR reads the MICR line with three different MICR algorithms and verifies that magnetic read with an OCR read of the line. The three algorithms are merged together with the OCR read to achieve a 99.5-99.7% MICR read accuracy rate, the highest in this class of scanners. The result is fewer teller interventions to correct or fill in missing data, fewer returned items from the Fed, a faster teller transaction experience, and most important, a lower cost of operation for the bank. NCIs can overwhelm an image processing department if the bank is not prepared ahead of time to properly deal with them. Digital Check recommends that we are engaged early in the process, helping the bank to identify potentially challenging documents and incorporating them into our special documents handling feature. It is a simple process of providing a sample image of the document (actual documents are not necessary) in advance so that our developers can provide the thresholding settings for those documents in an INI file that is incorporated into the capture application. Any time in the future that additional difficult items are identified, images of those documents can be provided to Digital Check and incorporated into the INI file. Banks we’ve worked with have experienced significant reductions in the number of NCIs and tremendous improvements in MICR read accuracy after applying Best Read technology. For more information on Digital Check’s Best Read technology, contact us at 847-446-2285 or fill out our web contact form.